The easy to use HOOK² 9 TripleShot fishfinder offers simple menus, easy access to key functions and Autotuning sonar. HOOK² 9 features TripleShot three-in-one sonar with wide-angle, High CHIRP coverage, SideScan and DownScan Imaging™, plus a built-in, high-detail US map. Just plug it in and fish. Yes, it's that easy. Be free to focus on fishing with Autotuning sonar, a new feature that actively adjusts sonar settings as fishing conditions change. You just fish and let HOOK² take care of sonar performance – performance powered by TripleShot three-in-one sonar. Anglers will cover more water in less time and find fish and fish-holding structure more easily with TripleShot three-in-one sonar. TripleShot features wide-angle, High CHIRP sonar—with double the sonar coverage of most fishfinders—plus SideScan and DownScan Imaging™. Returning to your favorite fishing spot or finding a new one is easy with the navigation features in HOOK², including a built-in, high-detail US map with one-foot contours of more than 3,000 lakes. 9" diagonal SolarMAX™ Display: Get crisp and clear views of fish and fish-holding structure with the excellent clarity and daylight visibility of a high-resolution SolarMAX™ display. For more about the new technology behind the IPS display used in the Hook2, see our West Advisor article: Amazing New IPS Displays for Marine Electronics. Automated sonar settings: You will spend more time fishing and less time dialing in your sonar with HOOK² Autotuning sonar. Just plug it in and fish. It doesn't get any easier. Easiest-to-use menu operation and Dedicated Keypad: Make the adjustments you want with fewer key presses via a simplified menu layout and dedicated keypad. 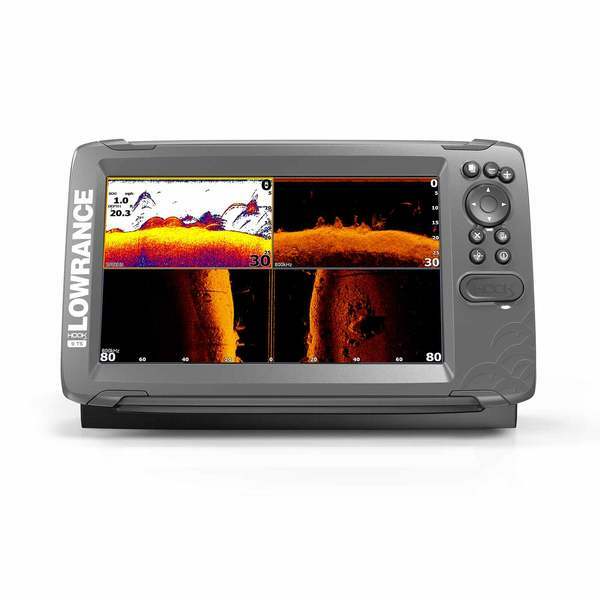 Exclusive Tripleshot™ three-in-one Sonar with High CHIRP, SideScan and DownScan Imaging™: TripleShot three-in-one sonar makes it easier to stay on the fish, delivering the best traditional sonar views and lifelike images of fish-holding structure beneath and beside your boat. Built-in detailed mapping: Easily find depth changes, roadbeds or your favorite fishing spot on the built-in, high-detail US map in HOOK2, featuring one-foot contours or more than 3,000 lakes. Mapping options: You can easily upgrade the mapping on your HOOK2 with optional mapping cards from C-MAP, C-MAP Genesis, Navionics® and more. microSD card slot: Save your waypoints, routes and trails to a microSD card or upgrade your mapping with an optional chart card. Easy front-dash or gimbal-bracket mounting installation: Pick the best installation option for your boat from simple flush-mount and gimbal-bracket installation options. Screen Cleaner and Protectant with PTEF, 8oz.